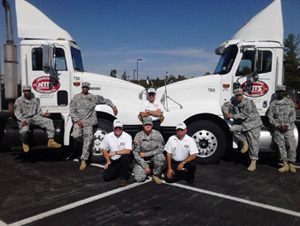 NTTS is a viable training option for active duty, transitioning military personnel, and returning veterans with daily or weekend CDL training courses and modern convenient housing. If qualified, tuition for CDL training and housing is covered through Post-9/11 GI Bill® Benefits, New York State Veterans Tuition Award (NYSVTA), and Federal Tuition Assistance (FTA) programs. Additionally, several of NTTS graduate employers offer VA-approved paid apprenticeship programs and tuition reimbursement if qualified. Our two locations located in Buffalo and Liverpool, NY have Commercial Truck Driver training programs approved so eligible veterans can use the Veterans Administration (VA) funded Post-9/11 GI Bill® Benefits to pay for truck driver training in full if qualified. Many options exist to help veterans receive affordable CDL training. Qualified veterans, active duty, reserve, national guard are eligible to receive educational benefits to assist with their NTTS tuition and housing expenses. The Post-9/11 GI Bill® benefits provide financial support for qualified veterans, the MGIB-SR program may be available if you are a member of the Selected Reserve, and the REAP program makes certain reservists who were activated for at least 90 days after September 11, 2001, are eligible for benefits. The Post-9/11 GI Bill® benefits provide financial support for education up to $23,671.94 per academic year National Maximum and a basic housing allowance to individuals with at least 90 days of aggregate service after September 10, 2001, or individuals discharged with a service-connected disability after 30 days. You must have received an honorable discharge to be eligible for the Post-9/11 GI Bill® benefits. The MGIB-SR program may be available to you if you are a member of the Selected Reserve. The Selected Reserve includes the Army Reserve, Navy Reserve, Air Force Reserve, Marine Corps Reserve and Coast Guard Reserve, and the Army National Guard and Air National Guard. You may be entitled to receive up to 36 months of education benefits. This is a Department of Defense education benefit program designed to provide educational assistance to members of the Reserve components called or ordered to active duty in response to a war or national emergency (contingency operation) as declared by the President or Congress. This program makes certain reservists who were activated for at least 90 days after September 11, 2001, either eligible for education benefits or eligible for increased benefits. New York State Veterans Tuition Awards (NYSVTA) are awards for full- or part-time study for eligible veterans who served in Vietnam, Persian Gulf and Afghanistan that are attending an approved vocational program in New York State. Eligible veterans may receive awards up to $3,435.00 as per HESC. New York State Higher Education Services Corporation. GI Bill® is a registered trademark of the US Department of Veterans Affairs (VA). Want to learn more about CDL Training for Veterans? Complete the requested information and we will be in contact with you shortly!